Dahi wale aloo are popular among Marwaris. They call it dahi aloo shak. Traditionally onion is not used in this dish but I think onion enhances the flavor of this sabzi. 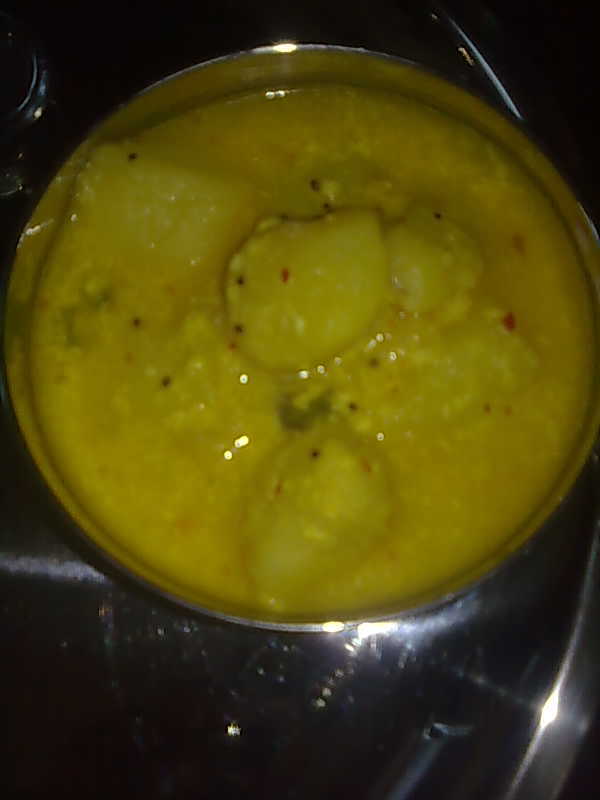 Also in the traditional recipe yogurt is added first, then aloo are added but in the given recipe I have added curd later. This is an easier way because if you are not used to cooking with curd, it might curdle and you may end up getting lumps. 1. Break aloo by hand to get unevenly broken pieces. 2. Heat oil in a pan and add rai. When they splutter, add hing and onion. Saute for 1 minute. 3. Add ginger and green chillies. Fry for 1 minute. 4. Add potatoes with 1 cup water and salt. Let it come to boil. Lower heat and simmer for few minutes. 5. Add beaten dahi and simmer for 1-2 minutes stirring. Add garam masala. 6. Turn off heat and serve dahi wale aloo hot with roti, paratha or poori.